Whatever type of cyclist you are, it pays to know your rights and responsibilities in law. 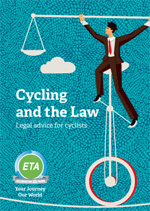 We’ve transformed Cycling and the Law into an e-book, making it even easier to read and share this handy guide for cyclists. To download your free copy, subscribe below to receive our weekly newsletter, packed full of fun and insightful articles from our resident cyclists. Don’t worry; we’ll never pass your details onto third parties or send you unsolicited emails – only relevant news, offers and promotions. Already a subscriber? Just enter your email address and hit ‘Subscribe’. You’ll receive a link to update your profile, then you just need to check the box next to ‘Cycling and the Law’. You won’t receive any additional or unwanted communications from us.